Guide4WDW.com: How We Rode All 3 Toy Story Land Attractions in Under 45 Minutes! How We Rode All 3 Toy Story Land Attractions in Under 45 Minutes! We are sadly home from Walt Disney World so we'll be ramping our content back up and getting back to our consistent posts. However, we're starting out with an answer to a highly sought after question by many guests. How do you avoid the lines of Toy Story Land? Truthfully, it wasn't all that hard to do and is even easier to explain. Throughout our three day stay we spent no longer than 35 minutes waiting for Slinky Dog Dash and in this particular instance we basically walked on the attraction twice in one morning. Before we get started, I just want to say that for this to work you do need to be staying at a good neighbor resort or Disney Resort. It's no secret, but extra magic hours play a huge role in allowing your wait times for this land to remain quite short. Second, and perhaps more importantly is the fact that we toured Toy Story Land on a Saturday morning, but we'll get to more details on that shortly. The key to this whole plan, as mentioned above is extra magic hours. For resort guests, throughout nearly the entire summer, Toy Story Land has featured early entry from 7:00-8:00am basically every single day. Extra Magic Hours are great but what's better to know is that on many days Hollywood Studios is opening the land early. 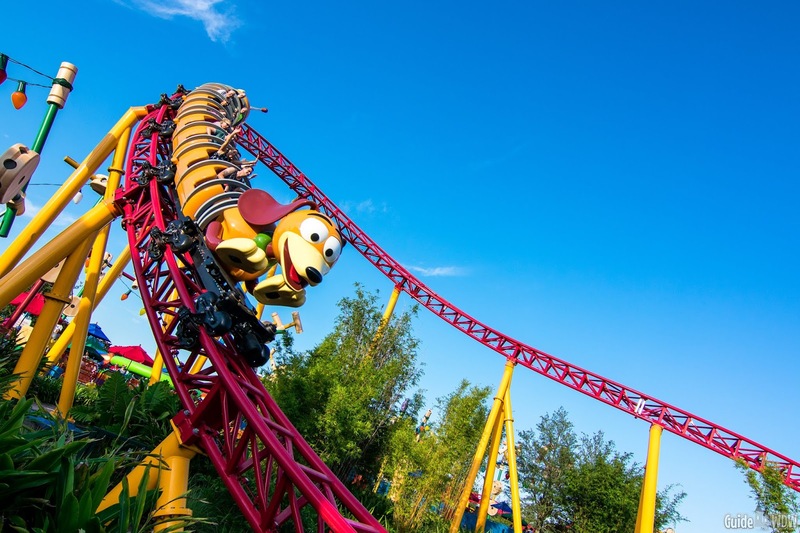 For example, we were not stopped in any way when we entered the park at 6:45am and were riding Slinky Dog Dash by 6:55. We legitimately waited at most 5 minutes in the queue. After the attraction ended, we resisted the temptation to get right back on (since the wait was shorter than the posted 20 minutes) and made our way over to Alien Swirling Saucers instead. The second attraction, much like the first, had a very short wait time of about 15 minutes. We were thrilled and rode the saucers and then made our way to Toy Story Mania for a classic ride that we had enjoyed many times before the queue was redesigned. We'll share some thoughts on the Toy Story Land expansion as a whole in the coming days, but for now we're just going to share some of our tops tips to beat the wait times. As we were boarding Toy Story Mania I happened to look down at my watch and we had been in Toy Story Land for 45 minutes. Obviously, it seemed like a great article at that point and one that I could share the details of rather quickly in hopes that it may help someone out along the way. However, the best part about all of this is that we did all three of these attractions without a fastpass+ selection for anything we chose to ride. We had no special pass, this wasn't a media day, and of all days of the week, we managed this on a Saturday morning. Quite possibly that could be a hidden trick to all of this. Other days during our stay the wait times (according to the app) remained rather short as well up until around 8:30 and the rush of non-resort guests started piling in. With that being said, very few people want to get up and get to the parks by 6:50am on a Saturday and it does tend to play in your favor if you are willing to get their early in the day. After our quick ride on Toy Story Mania, we actually had the opportunity to jump back on Slinky Dog Dash one more time at a slightly longer wait time of about 25 minutes. It was and is worth every minute of that wait. We then proceeded to ride Toy Story Mania a second time with a 15 minute wait! The entire morning was a blast and something that I highly recommend doing if you're considering a day at Hollywood Studios. It's the perfect way to avoid lines and if mornings aren't for you, consider heading to Toy Story Land at night. We spent two late evenings in the land and at around 10:00pm, as the Star Wars fireworks begin, the crowds tend to drop off fairly dramatically for attractions. You may not be able to get all three attractions in before park closing time, but you should be able to snag a shorter 40 minute or so wait time for Slinky Dog Dash. Again, it is more than worth every minute in line. There are so many guests obsessing over getting that perfect Slinky Dog Dash fastpass selection (including myself at one point). Truthfully, you may not even need it, and you may be better off saving that fastpass for Rock 'n' Rollercoaster or another favorite attraction or show in Hollywood Studios. We did secure a fastpass for later that afternoon but we ultimately would have missed it if it weren't for some technical difficulties that downed the ride and allowed us to use it anytime that night instead. At that point we had ridden it twice and loved every minute of it, but getting there early in the day and even before official park opening made all the difference in our day and making the most of that day of our vacation. We left Hollywood Studios right after lunch and managed to hop over to Epcot and ride a few attractions we expected to have to skip on this rather short vacation. That early morning essentially saved us an entire afternoon. Would it be difficult to try this super early morning with kids, possibly? Would it be worth it? Without a doubt! At the very worst you can head back to your resort and wrest for a bit early in the afternoon. Inevitably there are other ways to tour Toy Story Land, but I would say this is one of the best and most time effective ways to do so. If you can get there a little before the crowds and get that extra 10-15 minutes of extra time in the Land before the park "officially" opens to early entry guests, it's certainly worth getting up as early as possible. Truth be told, I'm not entirely sure how early they opened the park that particular day of our visit, but I have heard that those extra few minutes are becoming more and more normal for Hollywood Studios this summer. I can't guarantee this strategy will work for you but if you want to learn more about our tips for Toy Story Land, be sure to follow the site over the next few days as we try to share any and all tips we ran into during our recent visits.